That is the Associated Press photo that was used in a TON of press releases (like this one) regarding New Year’s Eve in Sydney. That is the view of Farm Cove from Mrs Macquarie’s Point. 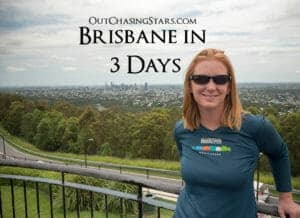 Guess where Starry Horizons is in that picture? Luckily for us, the boat directly in front of us had those bright underwater lights. David and I look at each other. We are doing this ONCE in our lives. No snoozing on making it the best New Year’s Eve we’ve ever had. 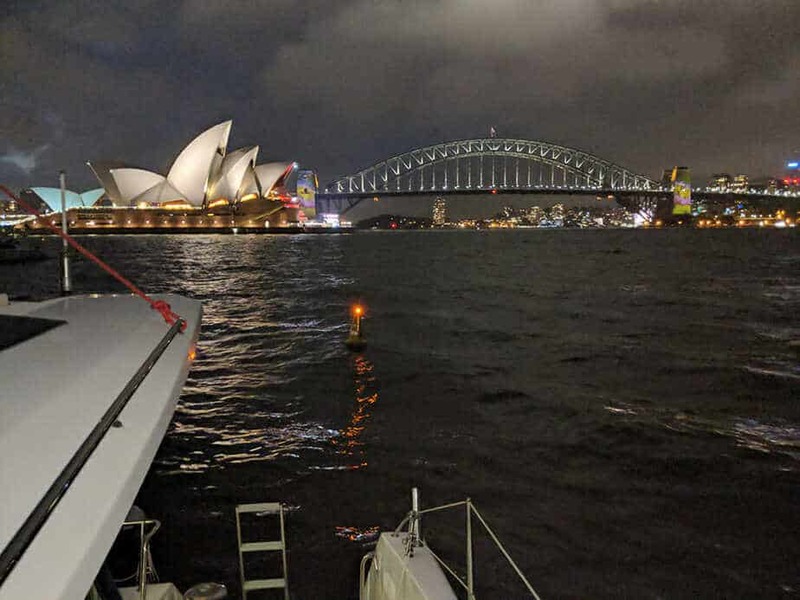 We left our temporary home at Blackwattle Bay at 7 pm on the 30th and motored out past the Sydney Harbour Bridge and the Opera House. There were some boats out in Farm Cove, but we hoped to still be able to get a spot, and we did! Sydney’s marine traffic is pretty organized for New Year’s Eve. At 8 pm an Exclusion Zone is enforced. 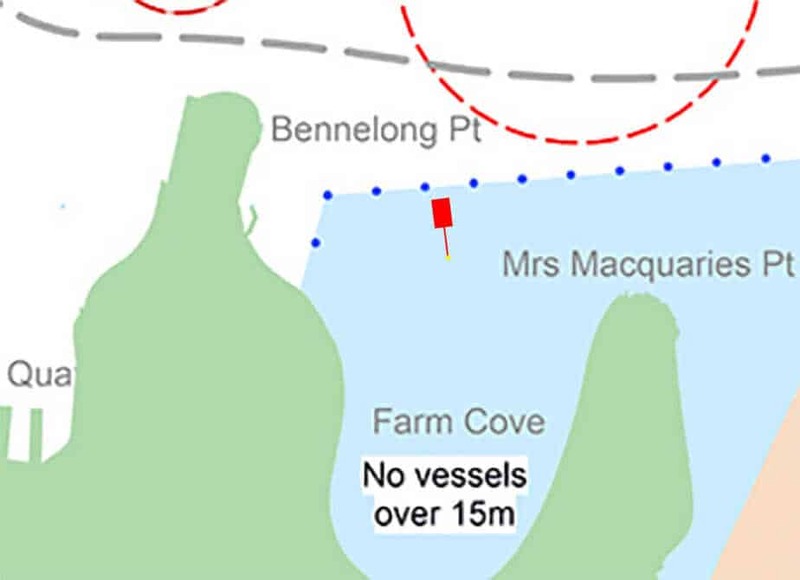 Boats are not allowed to be motoring in the main areas of Sydney Harbour, so it’s important to be in a bay by the time the exclusion zone hits – otherwise you will be stuck where ever you are. This is important because the exclusion zone is designated with yellow flashing buoys. When picking your anchorage, be mindful of the buoys. When we arrived at about 8pm, the wind was blowing from the south. We dropped anchor about 2/3 of the way between to the Opera House from Mrs Macquarie’s Chair. When we pulled tight on our anchor, we were JUST inside the buoys for the exclusion zone. Some neighboring boats were practically touching the buoys. We had a quiet night, and we didn’t think the wakes from the harbour boat traffic was all that bad. Winds from the south blew us towards the buoy. Not to scale. On the 31st, the wind shifted to come from the NE, thus we had swung around away from the buoy. Traffic was coming in and people were anchoring all over the place. Farm Cove grew packed very quickly and we were bouncing around a lot more. Our position in the morning and when fireworks went off. Not to scale. Now, here’s the key point. Marine Services were out in their boats and they did not let any boats anchor between us and the buoy. 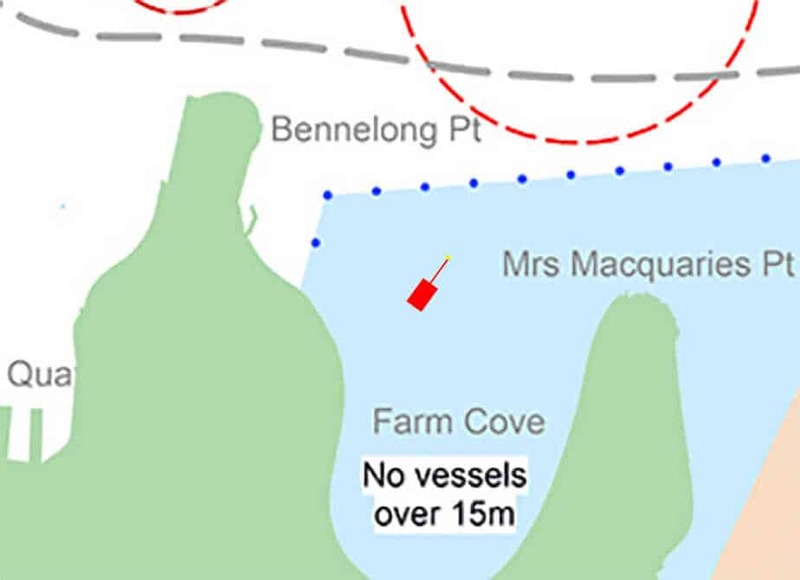 Which makes sense, because anyone who drops anchor between us and the buoy would swing into the exclusion zone if the wind shifts. Not only did MS keep our boat in the front row, but they also helped everyone out throughout the day. Those guys were working CRAZY hard, and it would have been a cluster without it. If someone anchored too close, you could flag down the MS guys and they would get whoever was too close to move. There were a lot of people making BAD anchoring choices out there. The wind was pretty high, so many boats dragged anchor. Sometimes they dragged onto another boat. Sometimes people just anchored too close. We even saw a powerboat cut too close to a sailboat’s anchor rode and catch it in his prop. Sucked for the sailboat, as they had a powerboat banging into them until they were able to get the powerboat unhooked, and sucked for the powerboat, as they ended up having to be towed away. We spent the entire day out on the deck. We got incredibly lucky, as no other boats even touched us the entire day. A few tried to anchor around us but eventually ended up moving. We felt a sense of camaraderie with our neighbors, looking at each other and shaking our heads every time someone dragged off, or shouting (politely) out to a new boat coming in “you’re going to be right on top of their anchor!” or “you’re too close to them!”. As it got later in the day, the Marine Service guys did allow smaller boats to anchor between us and the buoy. I’m not sure what they were using for a guideline, but no masts blocked our view. Right before the fireworks displays, groups of kayakers came in to watch and there were a few boats (sailboats and motorboats) that were motoring around the anchorage during the show. They all seemed to be commercial charters, so I’m not 100% sure what the deal was there. The show itself was spectacular. There were two aerial shows, one at 6 pm and one at 8 pm. The 8 pm show was during the exclusion zone time, so they were flying significantly lower. There was a firefighting boat that came through spraying full blast. A parade of boats all lit up took place, which most of the commercial boats in the area (dinner cruises like I used to do!) took part in. There was a smaller fireworks show at 9 pm, and then of course, the big kahuna of a show at midnight. I watched the fireworks shows from the lounge deck on Starry Horizons. Our view on December 30th at night. 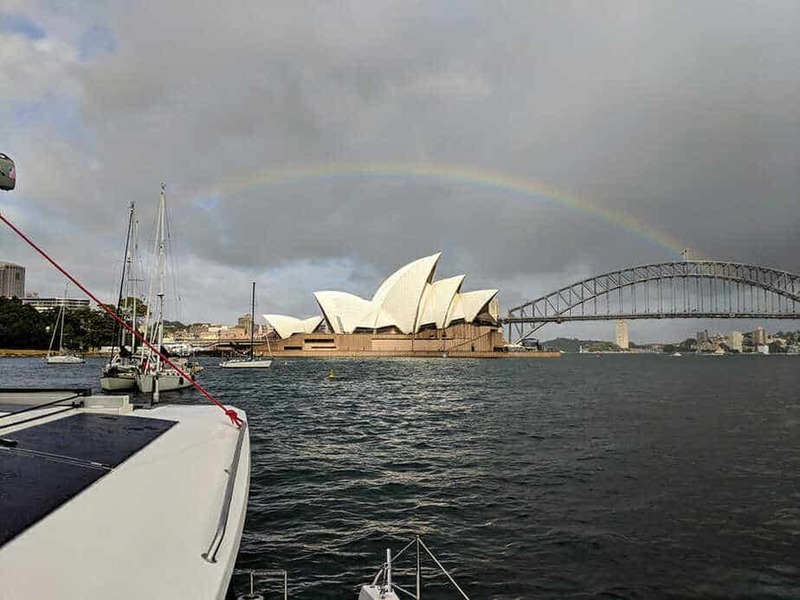 New Year’s Eve morning graced us with a full rainbow over Sydney’s best landmarks. Those two monohulls did NOT stay rafted together. 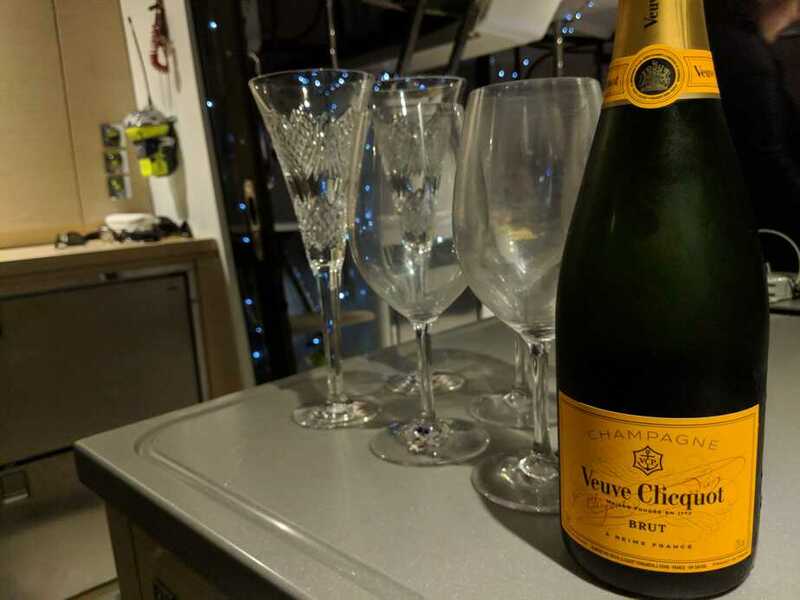 A little bubbly prepared for our toast. A view of the fireworks directly in front of us. 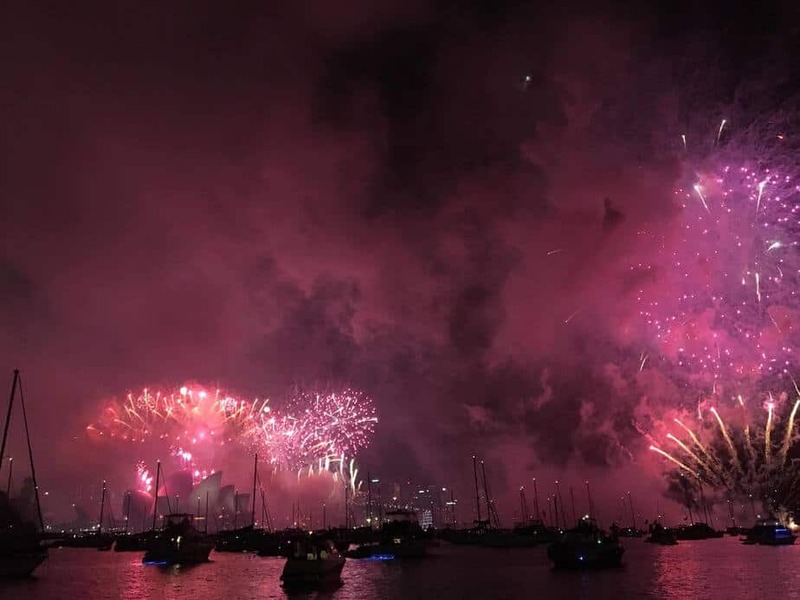 Sydney’s New Year’s Eve fireworks light up the harbor. It did get pretty smokey. In the aftermath, David and I stayed up until two am. The exclusion zone reopened at 12:45 am and boats picked up anchor and left. We stayed awake just long enough to make sure almost everyone who was planning on leaving Farm Cove for the night had done so, and then we went to bed. When we woke up (6 or 7 am) there was not a lot of activity in Farm Cove. 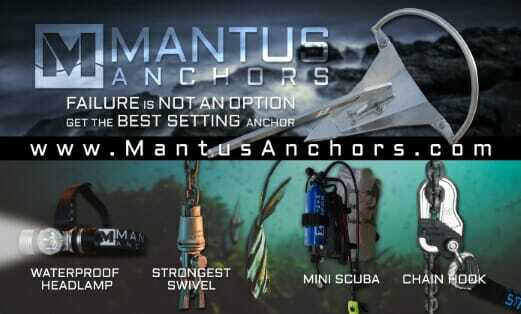 We upped anchor and were able to get our spot back in Blackwattle Bay. We had SUCH an amazing night. I don’t know that we will ever have a better New Year’s Eve. 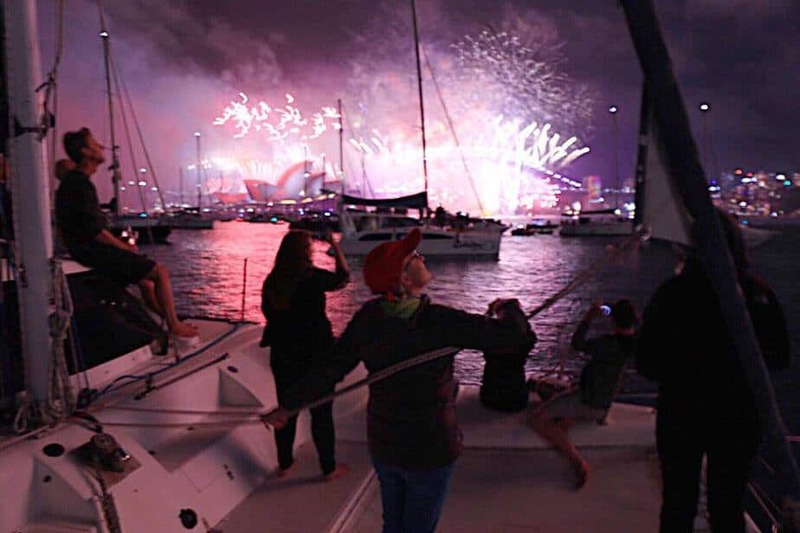 Projection Travel’s New Year’s Eve in Sydney – Our friends that we originally met in Panama have now purchased a catamaran and are offering charters in the Sydney area. 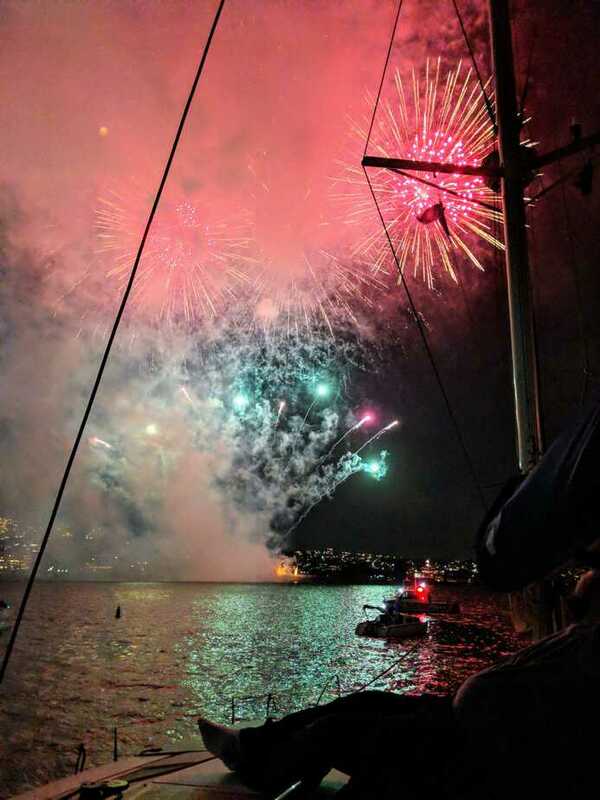 East Sail’s New Year’s Eve on Sydney – This is one of the companies whose boats were roaming around the anchorage during the show. I have no idea how you can end up on a kayak in Farm Cove in NYE, but that would be cool. If you have information on that, let me know. Projection Travel’s View of NYE in the harbor. 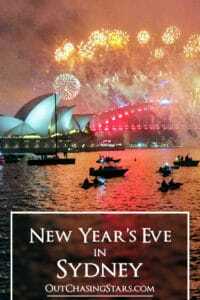 The Royal Botanical Gardens has a free option for watching New Year’s Eve from near Mrs. Macquarie’s Chair. The catch is, the doors open at 10 am, and it’s first come, first serve, in addition to the fact that you can’t BYOB and there’s alcohol for sale on site. You can’t even bring a folding chair. People camp overnight to get the best spots. Sure, we hung out at anchor overnight for our spot, but we had the luxury of Starry Horizons to keep us comfortable. 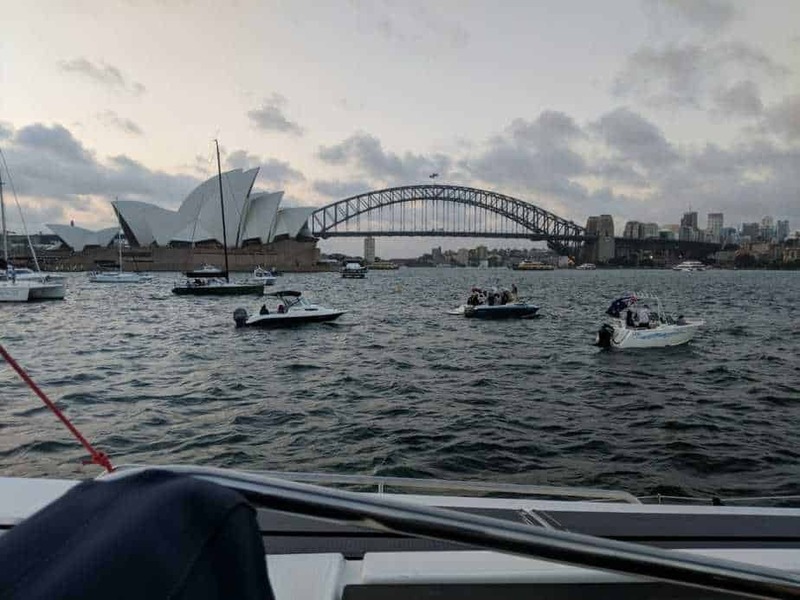 The next best option to having you own boat (and thus having invested major $$ into it) is to participate in one of the Royal Botanical Gardens’ ticketed events. There are two choices, one called The Point and one called Midnight at the Oasis. Both are adults only, both are hundreds of dollars, plus drinks. 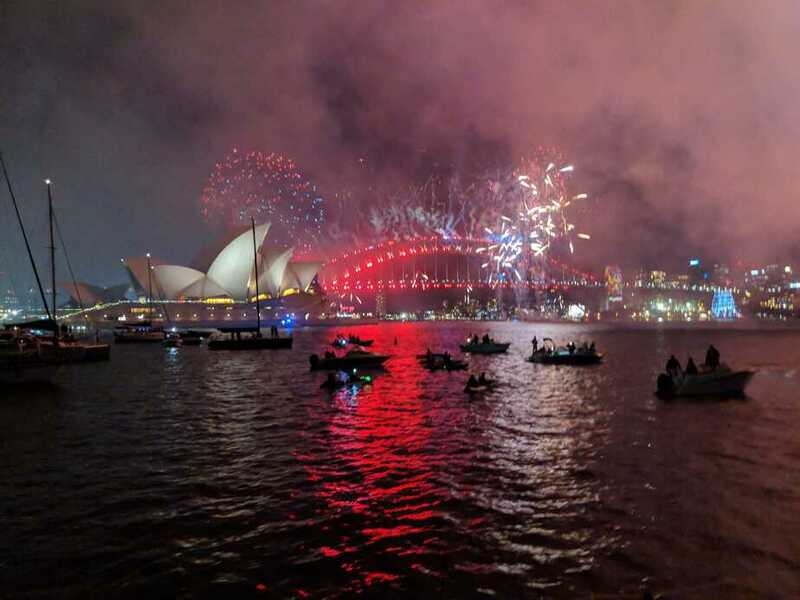 Of course, there are many other places in Sydney to view the fireworks, but if you want that best view, the above choices are your best bet. 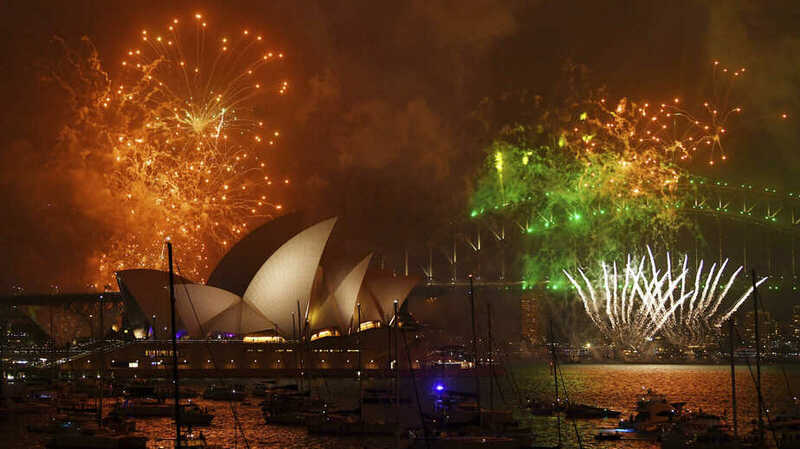 For more locations, check out The Sydney Expert’s post on all the locations for NYE. 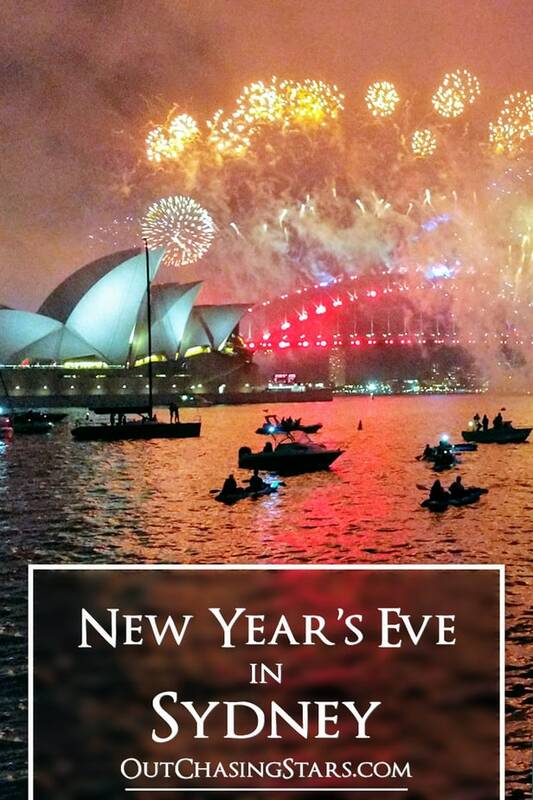 There is an official Sydney New Years’ Eve website. This site has a map of most vantage points, including a boating section with a map. We were super lucky with that rainbow! I spent one NYE in Sydney on a boat in the Harbour… definitely my most unforgettable NYE yet!! This is a great list. I never thought about watching them from the water. That probably is the best view! and not too crowded either! Exactly! And there’s not the inconvenience of the shore side viewing spots. I couldn’t imagine camping overnight and then spending all day jam packed in a park with no where to sit. Expert sailors, you two!! Your incredible viewing spot is a testament to your sailing savvy, but I think the thing that must have made it extra, extra special was that all of David’s family was with there with you too–visiting from Texas–and Brian, Jan, Julie and Thomas got to be with you and check it off their “bucket list” too!! It was really amazing. We enjoyed having the family visit! I watched them on the TV this year and felt like such a cop out (I did have the door open so I could hear them). Next year I either want to do a boat or the ticketed event at Barangaroo that’s super cheap. It’s great to do it proper at least once. Then you can get back to the TV! I’ve always wanted to spend a NYE in Sydney. Such fantastic tips. Hopefully I get to see it one day! 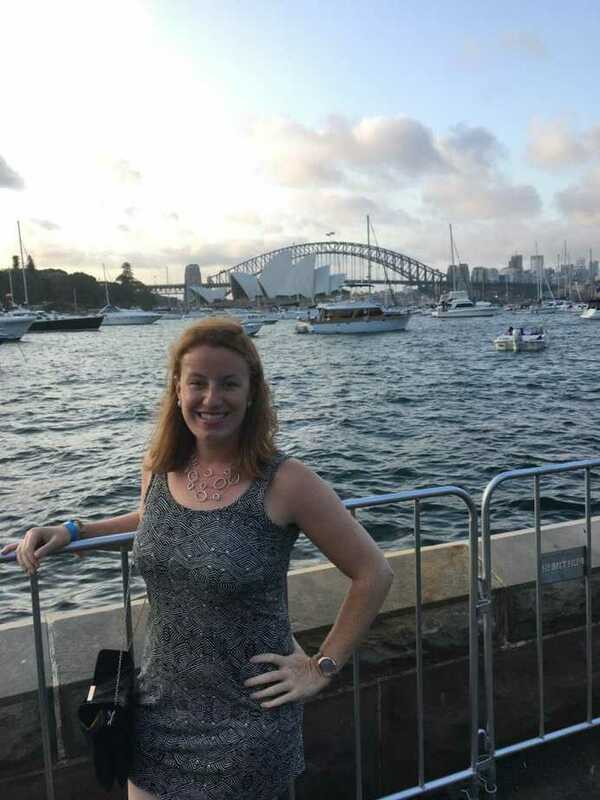 Amy, my heart filled with joy when I saw this post because ever since my first trip to Sydney last June, I have been dreaming of going back and even moving there to live! 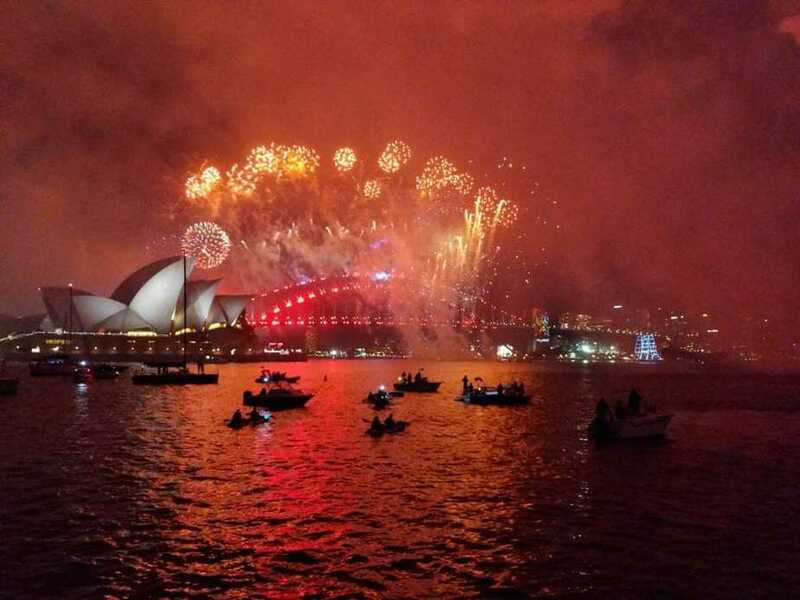 Visiting Sydney during NYE is one of these bucket list items I NEED to do one day soon, so I will keep this post handy to help me plan the experience better. Thank you for sharing! Aw thats so sweet! It was such an amazing night. I’m sure it will be our best NYE ever. What a great place to celebrate New Year’s Eve! Love all of the firework photos. Thanks! Taking good shots from a boat floating around isn’t all that easy! Nice glasses for the bubbly!